If you’ve followed my rantings for any time, you know how much I appreciate ramps (or wild leeks), those aromatic billboards that announce SPRING in the northeast. (Check out my post of May 17, 2011 for a full report on digging them.) We have had and are having a very weird spring – we’ve had 80 degree days followed by freezing so the usual spring veggies have been having a hard time maturing. We intended to dig ramps this past week – we had seen them in the farmers market although they were quite small – but when I started to lower the fork into the damp earth I could tell that they were just not quite as big as I would like so we took just a few to satisfy our longing for their almost sweet garlicky/shallot flavor and put ramp digging on the agenda for later this month. 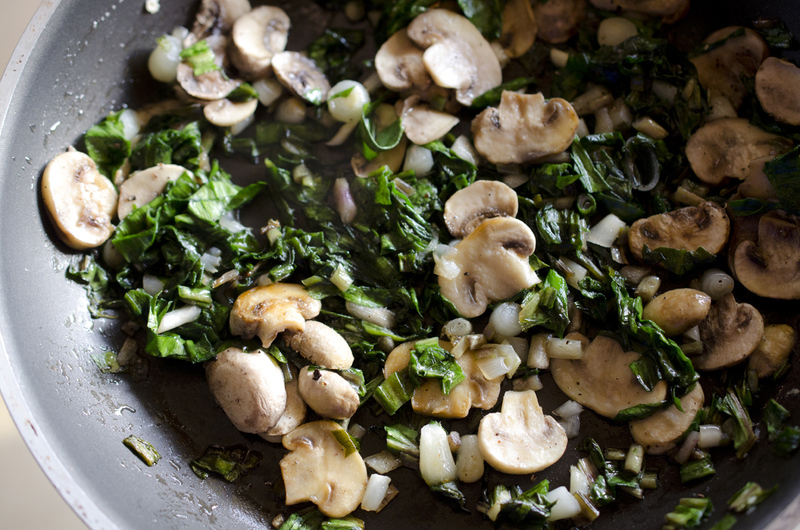 Not willing to waste even a part of the small batch we brought home, I chopped up the lot, greens and all, and sautéed them with some button mushrooms I had on hand. A little salt and pepper, a poached egg on top, and dinner was delicious! Ramps always look wonderful, we just don’t get them here though – it’s such a shame! Can you get early garlic- it works well, also. Not quite as distinct a flavor but would make a good substitute – Happy Spring! We do have wild garlic growing in our front garden, that might be nice. Absolutely try it – why not? Let us know how it works.